Skeleton keys have long been used as protective amulets and charms, due to being made of iron, through out many cultures and folk practices. 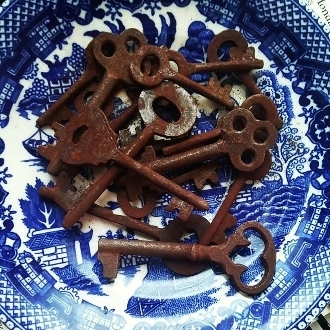 These skeleton keys are beleived to be from the early 1900's and are a bit rusty and oily due to age, use and storage. Keys average from 1.5 to 3 inches. Please specify large or small, by checking the "size" box then choosing a size from the drop down menu, or I will choose one at random.